a short note as I observed several articles making use of data binning. I am not saying that binning is automatically wrong, but it has at least one important potential flaw. 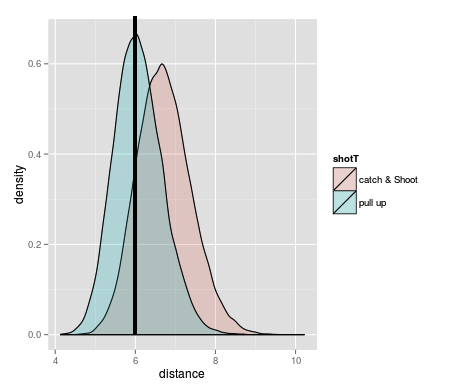 Let's use the catch & shoot vs pull up shooting percentage as an example. It is shown that catch and shoots are generally more open than pull ups. Furthermore, let us say that we define an uncontested shot as any shot where no defender is in a distance of 6 feet (that is binning). we can clearly see that the mean weight is not the same for catch & shoot and pull ups. Both for contested and uncontested shots, hypothetical pull up shots are clearly more contested. That's it for right now. Don't say I didn't warn you.